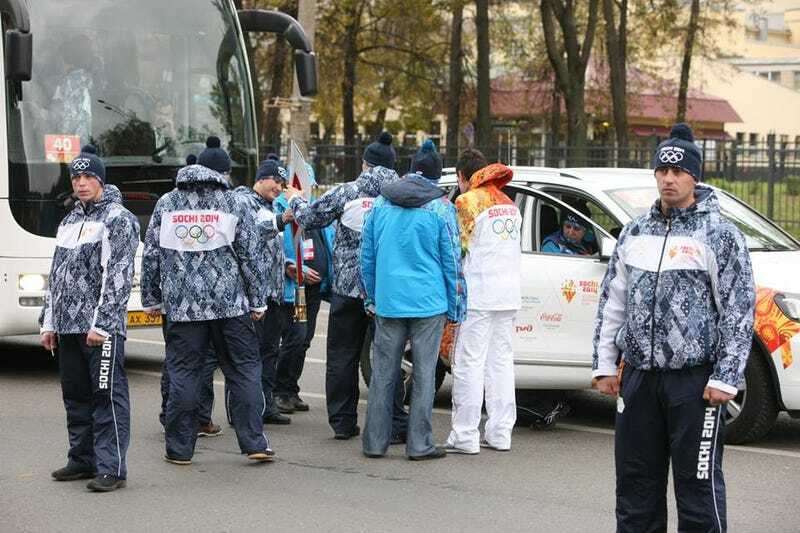 The Olympic torch relay began in Moscow two days ago, and the flame has already been extinguished four times. It's a slight embarrassment for the host nation, but a fairly large one for the factory that made the torches, and also happens to make ballistic missiles. On Sunday, just minutes after Vladimir Putin ceremonially kicked off the relay, the flame went out in the hands of former champion swimmer Shavarsh Karapetyan as he carried it around the grounds of the Kremlin. This does happen, and that's why the relay always keeps a backup flame on hand—so the torch's light will always be a descendant of the flame lit in Olympia, Greece, by the sun's focused rays. Karapetyan didn't wait for that backup flame. A gentleman in a suit re-lit his torch with a cigarette lighter. The flame went out again along the river yesterday, and it took officials an awkward minute-and-a-half to get it going again. Radio Free Europe, which has been gleefully documenting the torch relay's troubles, notes that the president of the Sochi Organizing Committee originally tweeted in support of the torch manufacturer after the first outage. After the next three, the president deleted his initial tweet and has remained silent. The longest Olympic torch relay in history still has 120 days and 40,000 miles to go.